Pressed from the peels, mandarin is a beautiful oil for spas. An immune and lymphatic stimulant, mandarin also supports tissue regeneration and detoxification, reduces scarring and stretch marks, and is used to nurture dry, mature, wrinkled and dull skin. Mandarin is a wonderful cooling oil for the skin, aiding in balancing oily skin and healing acne, spots and puffiness. It is believed to improve one’s mood and relieve anxiety and stress. Other properties for mind include: calming and relaxing. See tangerine. Manganese violet is the inorganic compound called ammonium manganese(III) pyrophosphate. The formula indicates that pyrophosphate (P2O74-), ammonium (NH4+), and manganese(IIII) comprise this solid. It is prepared by heating a mixture of Mn2O3, diammonium phosphate and phosphoric acid. This material is a popular inorganic pigment. 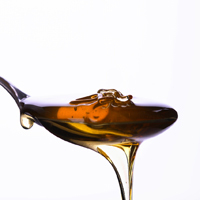 Raw Honey: Skin lifting and pore tightening. May reduce the appearance of minor breakouts. High Activity Manuka Honey: Antibacterial, antiseptic, antioxidant. High activity manuka honey has increased levels of antibacterial activity, and is extremely rich in natural proteins, vitamins and minerals which soothe and heal sensitive skin. It also contains a strong antioxidant which neutralizes free radicals caused by environmental factors such as air, sunlight and pollution, and which cause 95% of the skin damage, degeneration, disease, and discolorations. Manuka honey is derived by bees that collect nectar from the Manuka flower. This flower is found on the Manuka tree, Leptospermum scoparium, which is a graceful evergreen shrub or small tree with deep red wood of vigorous growth. Manuka has long been valued for its healing properties and is classified as antibacterial, ant-inflammatory, antioxidant, anti-fungal and anti-acneic. Manuka Honey is beneficial for skin ailments such as dermatitis, acne, eczema, boils, ulcers, oily skin, dandruff, rashes, sunburn and ringworm. Malvaceae, the family name of the marshmallow plant derives from the Greek word malake, or “soft,” referring to the soft, mucilaginous character of the plants. The genus name is the Greek word althea, which means “to heal”. The root of marshmallow is used in beauty care for its anti-inflammatory, emollient and thickening properties. Marshmallow is soothing due to its content of mucilage, flavonoids and anthocyanidins. Other active constituents include: phenolcarboxylic acids and amino acids. Good for all skin types, it is particularly beneficial to very sensitive, dry, weather-beaten, chapped or sun-damaged skin and is an excellent anti-inflammatory for acneic skin. Skin conditions marshmallow is particularly helpful for include: eczema, psoriasis, sunburn, windburn, wounds and varicose veins. It also soothes insect stings (especially wasps), provides relief for skin infections, and has the ability to draw out poisons and debris from a wound. Marshmallow root makes a great compress to reduce inflammation of the eyelid. It is used in dry skin treatments as a bath herb, facial steam, cleanser, moisturizer, lotion, soap, wrinkle cream and salve. For dry hair, the soothing properties are nourishing when used in shampoos, conditioners and hair rinses. Additionally, it is found in many hair styling products for all hair types. Powdered tea was originally brought from China to Japan in 1911 by the monk Eisai alongside Zen Buddhism. Both have become quintessentially Japanese. Matcha, the crème-de-la-crème of powdered teas is the oldest variety of shade grown green tea in Japan, has been part of Zen Buddhist culture for over 800 years and is the official tealeaf used in traditional Japanese tea ceremony. It is highly regarded for its health benefits, which have only recently begun to be documented by science. Matcha tea comes from the Camellia sinensis plant just as all other varieties of green tea. Yet the cultivation, processing, and the fact that the whole leaf is used make it quite distinct. The preparation of matcha starts weeks before its harvest, when the tea bushes are covered to prevent exposure to direct sunlight. Shading slows down growth and turns the leaves a darker shade of green resulting in a higher amount of chlorophyll and certain amino acids. Only the finest buds are hand picked for their younger, suppler leaves. The leaves are then lightly steamed to prevent oxidation, minimally processed to remove the stems and veins, then stone ground leaving a jewel-green fine powder of only the most nutrient-rich parts of the plant. more on matcha tea . . .
Mica (CI 77019) is an inorganic, colorless silicate mineral that provides luster and adhesion. Mica is used in most mineral cosmetics for its luxurious silkiness and subtly reflective properties. It is available in many grades, some known as “sericite” or matte, that range in textures from matte to shimmery. Approved for use in cosmetics in the U.S., E.U. and Japan. The word "mica" is derived from the Latin word mica, meaning "a crumb", and probably influenced by micare, to glitter. Mica is widely distributed and occurs in igneous, metamorphic and sedimentary regimes. Large crystals of mica used for various applications are typically mined from granitic pegmatites. Until the 19th century, large crystals of mica were quite rare and expensive as a result of the limited supply in Europe. Wet-ground mica, which retains the brilliancy of its cleavage faces, is used primarily in pearlescent paints by the automotive industry. Many metallic-looking pigments are composed of a substrate of mica coated with another mineral, usually titanium dioxide (TiO2). The resultant pigment produces a reflective color depending on the thickness of the coating. These products are used to produce automobile paint, shimmery plastic containers, and high quality inks used in advertising and security applications. In the cosmetics industry, its reflective and refractive properties make mica an important ingredient in blushes, eye liner, eye shadow, foundation, hair and body glitter, lipstick, lip gloss, mascara, moisturizing lotions, and nail polish. Some brands of toothpaste include powdered white mica. This acts as a mild abrasive to aid polishing of the tooth surface, and also adds a cosmetically pleasing, glittery shimmer to the paste. Mica is added to latex balloons to provide a colored shiny surface. Throughout the ages, fine powders of mica have been used for various purposes, including decorations. Powdered mica glitter is used to decorate traditional water clay pots in India, Pakistan and Bangladesh; it is also used on traditional Pueblo pottery, though not restricted to use on water pots in this case. The gulaland abir (colored powders) used by North Indian Hindus during the festive season of Holi contain fine, small crystals of mica to create a sparkling effect. The majestic Padmanabhapuram Palace, 65 km (40 mi) from Trivandrum in India, has colored mica windows.